Hell hath no fury as an opposition thwarted in its bid to pass a no confidence motion against a Prime Minister! 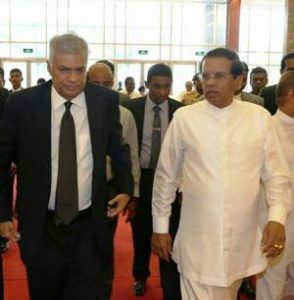 Sri Lanka’s self -styled joint opposition led unofficially by Kurunegala District MP Mahinda Rajapaksa and officially by Colombo district parliamentarian Dinesh Gunawardena is still smarting from the defeat encountered while attempting to pass a no confidence motion (NCM) against Prime Minister Ranil Wickremesinghe. The ill-advised move failed miserably. Furthermore instead of toppling the prime minister as intended, the NCM has only strengthened United National party(UNP) leader Ranil Wickremesinghe politically – at least for the time being.Moreover the impact of the NCM has resulted in the Sri Lanka Freedom Party(SLFP) fragmenting into three factions and facing the dismal prospect of a permanent division in the future. Unable and unwilling at this juncture to blame or confront President Maithripala Sirisena for the NCM failure the joint opposition has found a scapegoat in the form of the premier Sri Lankan Tamil political configuration known as the Tamil National Alliance(TNA). The joint opposition is training its guns on the TNA parliamentary group leader and leader of the opposition Rajavarothayam Sampanthan.The octogenarian Tamil leader was elected to Parliament from the Trincomalee district. While Rajavarothayam Sampanthan is to be commended for being “ready,able and willing” to face the envisaged NCM, the leader of the opposition seems to have made a slip in his references to the proposed no confidence motion . According to the “Daily News” Sampanthan reportedly said .“It is neither ethical nor the parliamentary tradition to bring a no confidence motion against an opposition leader. I think that nowhere in the world has an opposition leader faced a no confidence motion”. The veteran Trincomalee MP is correct in saying there is no parliamentary tradition of a no confidence motion being brought against a leader of the opposition but is incorrect when he says “I think that nowhere in the world has an opposition leader faced a no confidence motion”. There is a precedent and that too in Sri Lanka in 1981! Since Sampanthan himself was an opposition MP then it is indeed puzzling as to how the opposition leader “forgot”what had happened nearly 37 years ago. 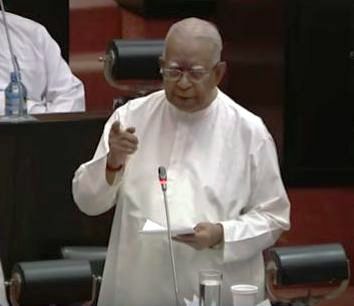 Given the efforts underway to present a no confidence motion against Sampanthan in Parliament it may prove useful to re-visit the not so distant past when a no confidence motion was brought against a leader of the opposition. 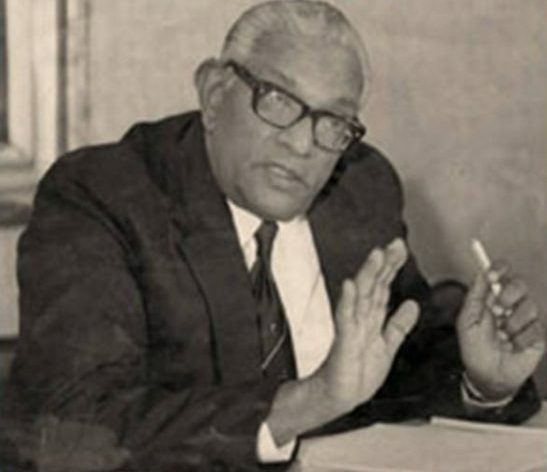 The UNP Government led by President Junius Richard Jayewardene went down in parliamentary history as the only govt whose ruling party members presented,debated and passed a no confidence motion against the then leader of the opposition in July 1981. In a remarkable coincidence the opposition leader at that time too was a Sri Lankan Tamil. Well-known Tamil leader Appappillai Amirthalingam the secretary-general of the Tamil United Liberation Front(TULF) was the leader of the opposition who underwent the “novel” experience of having Govt MP’s pass a no confidence motion against him. As a result Sri Lanka became the laughing stock of the world then. The circumstances that led to this bizarre event and the disgraceful manner in which the NCM debate was conducted in Parliament then deserves being related in some detail against the backdrop of a similar ‘no confidence in leader of the opposition’ move being currently planned. The General elections of July 1977 was a watershed in the post-independence political history of the Island nation. The country was virtually polarised on an ethnic basis with the Tamil United Liberation Front(TULF) contesting on a platform of separatism and winning 18 of 19 Tamil -majority seats in the Northern and Eastern provinces of Sri Lanka. The first past the post winner electoral system was in vogue then. The UNP won the bulk of seats in the eight provinces outside the North including the East. At the final count after the postponed Pottuvil election being held , the UNP had 140 seats including that of an independent who had crossed over in the then National State Assembly of 168.. The TULF came next with 18 seats. The SLFP which had polled much more votes than the TULF had only 8. The Ceylon Workers Congress had one seat but its leader and MP Soumiyamoorthy Thondaman was to join the Govt a year later.One elected independent also sat in the opposition. It is the tradition and practice in parliamentary democracies for the leader or nominee of the chief opposition party to be nominated as leader of the opposition. This procedure had been followed dutifully in Ceylon/Sri Lanka too. So with the SLFP being reduced to 8 and the TULF having 18, the Tamil party had to don the mantle of opposition leader. Amirthalingam first offered it to Thondaman who declined it. Thereafter Amirthalingam himself became leader of the opposition. The TULF president at that time was Nallur MP Murugesu Sivasithamparam who opted to let Amirthalingam be the opposition leader. In those days Sivasithamparam was referred to as the “Iyakkathin Thalaiver”(Leader of the movement) and Amirthalingam as “Inathin Thalaiver” (Leader of the people/race). It must be noted there was a precedent for the chief opposition party leader not accepting leader of the opposition office. In 1970 the UNP was the chief opposition party with 17 seats but it was not party leader Dudley Senanayake but his chief deputy JR Jayewardene who became leader of the opposition. Dudley remained party leader until his demise in 1973.Thereafter JR the opposition leader became party leader also. Amirthalingam becoming leader of the opposition created many issues. It was customary to regard the leader of the opposition as a potential future prime minister. The opposition party itself functioned like a govt in waiting with a shadow cabinet. In the UK parliament regarded as the mother of all parliaments the opposition leader is called “Her Majesty’s most loyal leader of the opposition”. In Sri Lanka a tricky situation prevailed as the leader of the opposition and his party had been elected with what was termed as a mandate for the separate state of “Tamil Eelam”. The country seemed polarised ethnically with the Govt hierarchy being “Sinhala” and the opposition leadership being “Tamil”. Many Sinhala people resented Amirthalingam as opposition leader because in reality the chief opposition party in terms of votes polled was the SLFP and the opposition leader should have been Sirima Bandaranaike. A quirk of fate in the form of lopsided electoral results had brought about a strange turn of events. JR himself preferred Amirthalingam as opposition leader over his ‘bete noire’ Sirima Bandaranaike. After all did he not deprive her of civic rights in 1980?. So the UNP Govt did not block Amirthalingam from becoming opposition leader and even tacitly supported it. Amirthalingam however was in an unenviable position. The TULF had whipped up emotions among Tamils in general and the youths in particular for the establishment of a separate state called Tamil Eelam. 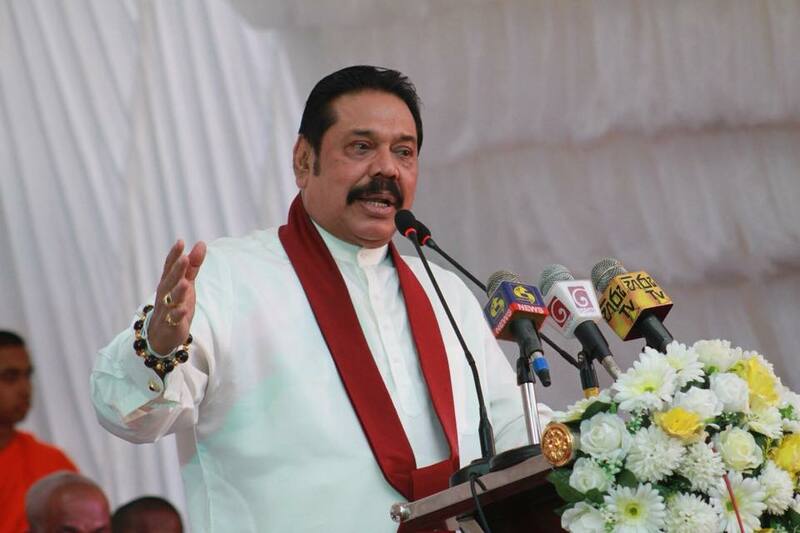 The Tamil people were called upon to make great sacrifices to achieve Tamil Eelam. It was a familiar sight at TULF election meetings for Tamil youths to line up and daub the foreheads of TULF candidates and speakers with blood after slashing their fingers. The youths expected the TULF to adopt a non – compromising stance after being elected. Many were disappointed by what they perceived to be a sell-out by Amirthalingam for the perks and privileges of a leader of the opposition post. It was felt (wrongly) that cunning JR had deftly co-opted Amirthalingam into his folds. Critical slogans began appearing as graffiti on Jaffna walls. Two slogans that I remember now are “Kaettathu Thamil Eezham. Kidaithathu Japan Jeep” ( Demanded Tamil Eelam and got Japanese Jeep) and “Ethirk Katchith Thalaimai Alla , Singala Arasukku Ethirppae Emakku Vaendum”(We want opposition to the Sinhala state and not the opposition leadership). In such a situation,Amirthalingam was caught in the middle. The TULF took up the position that although they were bound by the mandate for Tamil Eelam the party was willing to consider what Amirthalingam termed as a “Viable alternative”. Amirthalingam tried valiantly to steer a difficult path between commitment to the electoral mandate and the pragmatic necessity for democratic politics. He utilised the leader of the opposition post to interact with foreign leaders, diplomats, officials and media personnel and put across the Tamil viewpoint.By doing so he incurred the wrath of many hawks in the Govt like former Industries and Scientific Affairs minister Cyril Mathew who was dubbed the “industrious minister of anti-Tamil affairs”. A particular point which enraged the Govt was Amirthalingam’s conduct while abroad. There was a conventional expectation that leaders of the opposition do not criticise governments on foreign soil. While they could and should do so in their own land, it was seen as being “Not done” to air grievances and evince criticism to audiences abroad. Amirthalingam however considered himself to be a liberation movement leader and did not abide by such norms. He was very critical particularly when he addressed gatherings of Sri Lankan Tamils in the west or meetings in Tamil Nadu. Amirthalingam also violated protocol while abroad.As the leader of the opposition was on par with a cabinet minister , Sri Lankan diplomatic missions were expected to provide transport and other services to the visiting dignitary. Amirthalingam however dispensed with such protocol measures and opted to liaise independently with Tamil expatriates many of whom were supportive of a separate state. Under these circumstances , the relationship between the leader of the opposition and the ruling government was quite choppy and even stormy at times. 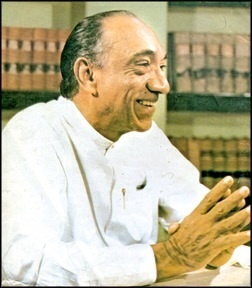 The UNP rule of JR Jayewardene too was eventful and particularly impacted on the Tamil people then. 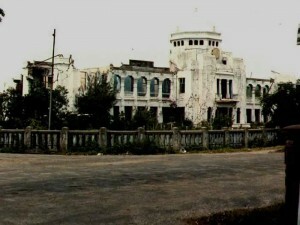 The August 1977 anti-Tamil violence, the introduction of the executive presidency, the 1978 Constitution, the appointment of non – Tamil district ministers for districts in the North-East, the 1979 emergency rule in Jaffna under the command of Brig. 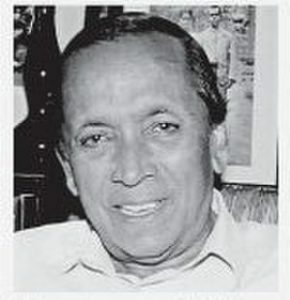 “Bull” Weeratunga, the Prevention of Terrorism act(PTA),the appointment of a commission on devolution headed by ex- chief justice Victor Tennekoon , the setting up of District Development Councils, Elections to the DDC’s, Police going on the rampage in Jaffna and setting fire to the Jaffna library, “Eela Nadu” newspaper office, TULF party headquarters and the house and vehicle of Jaffna MP V. Yogeswaran were but some of the developments that took place in the four year period from 1977 to 1981. Parallel and inter-related to this course of events was the rise of armed violence by Tamil militant organizations. Bank and Post office robberies, assassination of Police personnel, attacks on Police patrols,Killing of Tamils deemed as traitors or collaborators of the Govt,targeting of pro-Govt politicians etc were also incidents affecting the Tamil polity. Even though there was simmering inter-ethnic tensions the advent of DDC’s and the holding of elections to the councils was expected to bring about a quantum of peace and stability to the situation. Tragically the holding of DDC elections caused further deterioration and widened the ethnic divide. A disgusting flashpoint of prevailing tensions was the unprecedented no confidence motion against the then leader of the opposition Appappillai Amirthalingam. What had happened then was that the UNP contesting all the District Development Council electionsin the country was pitted against the TULF in the North and East. The TULF won the DDC’s of Jaffna,Mullaitheevu,Mannar,Vavuniya,Batticaloa and Trincomalee. There had been pre-election violence in Jaffna when the UNP chief candidate for Jaffna district Dr. A.Thiyagarajah was shot dead by operatives belonging to the PLOTE led by Umamaheswaran. A few other UNP workers in Jaffna were also killed in separate incidents. On May 31st 1981 the PLOTE shot and killed three policemen on duty at a TULF meeting in Naachimaar Koaviladdy in Jaffna. A large number of Policemen from outside areas had been deployed in Jaffna for election security.Many of these cops went on the rampage on May 31st and June 1st. This was in retaliation for the attack on the Policemen at Naachimaar Koaviladdy. The Jaffna public library, TULF Headquarters, “Eela Nadu” newspaper, Jaffna MP Yogeswaran’s house and a number of shops,houses and vehicles were torched by the errant Policemen. The burning of the Jaffna public library with 97,000 books including many first editions and rare manuscripts was a terrible event that shocked the Tamils. The incident was condemned as an act of cultural genocide by the civilised world.Naturally the TULF raised a huge outcry over this. Lacking the political courage to blame or penalise the Policemen responsible for torching the library the Govt tried to fault Amirthalingam and the TULF for alleged anti- national propaganda. Amirthalingam did not crumble under pressure. Instead he went on a global trip to countries such as the USA, UK and India where he related in detail the circumstances regarding the Jaffna library burning and exposed the fact that the Govt had not taken any constructive action. This enraged the UNP govt more. 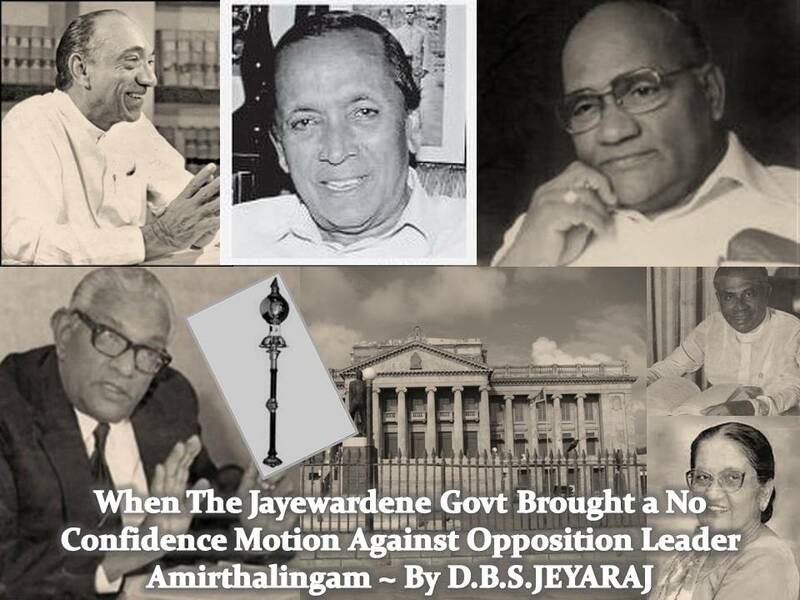 After Amirthalingam’s return the TULF gave notice of a vote of no confidence against the Jayewardene Govt in Parliament. This infuriated the UNP Govt greatly.When the TULF gave notice in Parliament for a vote of no confidence against the government, the UNP regime retaliated by giving notice of a vote of no confidence against the leader of the opposition. This was an unprecedented development in the Parliamentary history of not only the Island but of the Parliamentary democratic world. Although the custom was to afford priority to an opposition motion, the Govt overruled opposition objections and gave precedence to the Govt motion of no confidence in the leader of the opposition. The proposal mooted by then Panadura MP Dr.Neville Fernando was signed by 36 UNP Parliamentarians. It was widely believed and subsequently confirmed by Dr.Fernando that the no confidence motion project had the approval of President Jayewardena himself. President Jayewardena was regarded as all powerful then. Although there were many decent,learned persons in the UNP parliamentary group none dared to defy the “almighty” JR. Hence the UNP to its eternal shame went along with what was perhaps an all time low in parliamentary annals.The no confidence motion by members of the govt against the leader of the opposition was taken up in Parliament on July 23rd and 24th 1981.What followed was high drama of a cheap variety. At the outset Amirthalingam wanted to explain his position and rose to his feet. Pandemonium erupted. 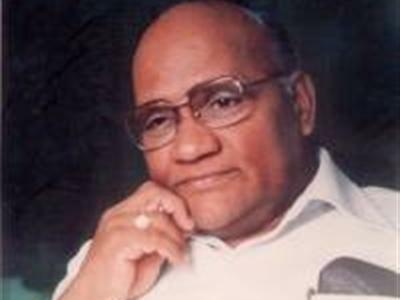 Amirthalingam’s voice was drowned in a flood of choice epithets like “traitor”,”liar”, and “tiger supporter”.Dr.Neville Fernando objected to Amirthalingam making a personal statement saying that he could do so only with the indulgence of the House. The speaker Bakeer Markar upheld Dr.Fernando’s objection and refused to let Amirthalingam speak. At this point the TULF walked out in protest. Thereafter SLFP deputy leader and Medawachchiya MP Maitripala Senanayake raised a point of order and submitted three reasons for the Speaker to rule the no confidence motion out of order.“Firstly, the vote of no confidence on the leader of the opposition did not fall within the powers of parliament. It had not happened anywhere in the world. Secondly, the leader of the opposition held his office in accordance to parliamentary convention and he enjoyed the confidence of the members of the opposition. He need not enjoy the confidence of parliament or that of the government members. Thirdly, the motion, even if passed, would not bring any result. Amirthalingam would continue to be the Leader of the Opposition even after the passage of the motion”. The speaker Bakeer Markar evaded the issue and said Senanayake’s point of order had been raised too late. Therefore he could not stop the no confidence motion being debated he said. The lone Communist party MP from Kalawana,Sarath Muttetuwegama chided the speaker saying that he was letting the Govt MP’s run Parliament. The SLFP and CP members also walked out in protest.Thus Sri Lanka witnessed the bizarre event of the Government conducting a solo performance of debating a no confidence motion against the leader of the opposition while the entire opposition had walked out in protest. Most cabinet or deputy -ministers from the UNP did not speak but there were some who did including district and project ministers.The backbenchers had a field day. Then followed a disgusting relay of speeches by UNP parliamentarians uttering dire threats of punishment to Amirthalingam and other TULF traitor MP’s. Horsewhipping, shooting them on Galle face green, Tying up on a post and whipping, mutilation, dumping in the Beira lake were some of the modes of punishment advocated. The most bloodcurdling threat was about reviving an ancient form of punishment allegedly practiced by Sinhala kings in the past against traitors. The victim was to be bound by his two feet to two bent arecanut trees tied with ropes.. When the ropes are cut the bent trees spring back upright. The victim would be torn apart. The speaker Bakeer Markar ordered three passages to be expunged as they horribly violated all norms of civilized conduct let alone parliamentary decorum. Among the four cabinet ministers who spoke during that debate was Soumiyamoorthy Thondaman the minister of Rural industrial development in the JRJ regime. Thondaman speaking in his capacity as leader of the Ceylon Workers Congress(CWC) was very critical of the no confidence motion.He also uttered a prophetic warning that undermining Amirthalingam would pave the way for an extremist type of Tamil politics to emerge.Finally it was voting time on July 24th.Thondaman abstained. There were 121 votes supporting the no confidence motion. There was however one solitary vote against the motion. The man who voted against the UNP motion was none other than the honourable member for Senkadagala,Shelton Ranaraja. By doing so he not only demonstrated that he was an honourable person but also helped salvage a little bit of honour at least for his party. Shelton Ranaraja’s principled stance on that fateful day was a a quiet display of courageous defiance. At the UNP Parliamentary group meeting held before the debate, only Shelton Ranaraja had opposed the no confidence motion against the Opposition leader. Describing it as a travesty of democracy, Ranaraja said it should be abandoned. 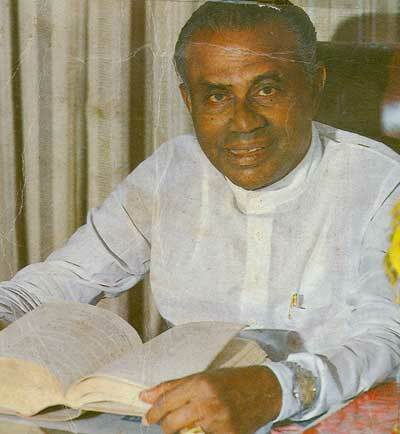 Otherwise he would have no choice other than to vote against it, he said.President Jayewardene would have none of it. JR said that Shelton could either keep away at voting time or abstain from voting but must not go against the party by voting against it. Even Thondaman would abstain after speaking out against the motion, Jayewardene informed Ranaraja. The Senkadagala MP kept quiet during the course of the no confidence motion debate while Thondaman made a hard – hitting speech. When voting time came . the loquacious Thondaman abstained but the hitherto silent Ranaraja – who was also expected to abstain – did the unexpected. He voted against the motion openly defying President Jayewardene and the UNP Parliamentarians. Shelton Ranaraja was prepared to stand up and be counted at the right time. When JR questioned him about it later, Shelton replied that he had voted according to his conscience. Knowing Shelton’s brand of principled politics, JR Jayewardene let it go at that. This was not the first time that Shelton Ranaraja had dared to go against Junius Richard Jayewardene. 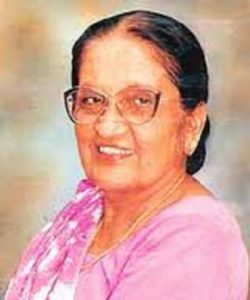 It was in 1980 that the UNP govt passed legislation depriving former Prime Minister and SLFP leader Ms. Sirima Bandaranaike of her civic rights. Shelton (though a deputy minister ) was present at the cabinet meeting that preceded the move in his capacity as acting minister of Justice. He opposed the taking away of Sirima’s civic rights at the cabinet conclave. A seemingly bemused JR smiled wryly at Shelton and quipped “you seem to be very fond of the lady.” Shelton replied “ I am not fond of any personalities. I care only for my conscience”. Later on JR told Shelton to keep away at voting time if his conscience troubled him. Shelton did so. However in the case of the no confidence motion , Shelton went against JR’s wishes boldly. This then is the story of a no confidence motion brought against a leader of the opposition by a ruling Govt. It appears that history may repeat itself in a different form with another vote of no confidence motion against a leader of the opposition. Then it was Amirthalingam and now it is Sampanthan, both of whom happen to be Sri Lankan Tamils. However the circumstances under which Amirthalingam became opposition leader are vastly different to that of sampanthan. Both appointments were “legal” but there are doubts about “legitimacy” in the case of Sampanthan. Moreover the NCM being mooted against Sampanthan is from opposition ranks whereas in Amirthalingam’s case it was from the Govt. With the joint opposition mounting pressure on Sampanthan the no confidence motion against the leader of the opposition seems inevitable unless saner counsel prevails within opposition ranks. While Sampanthan is being targeted by the joint opposition there is a growing school of thought among sections of Tamils that the TNA leader should give up his opposition leader post voluntarily. Cabinet minister Mano Ganesan recently observed whether it is worthwhile for Sampanthan to retain the opposition leader position when the Constitutional process has reached a standstill. There is also a feeling that Sampanthan functioning as the “UNP-SLFP Government’s Most loyal leader of opposition” is affecting the electoral fortunes of the TNA as demonstrated in the recent local authority polls. These and other related matters will be delved into in greater detail in a forthcoming article. « “Capo De Tutti Capi” (Leader Of All Leaders) Gotabhaya Rajapaksa Was The Undisputed Head Of All State Agencies Handling Military and Civil Intelligence. Instead of Taking Action Against Mob Which Attacked “Adara Sevana”Centre ,Police in Anuradhapura Tell Methodist Church Leaders Not to Allow People From Other Areas to Worship There. Contours of the Lawsuit Filed by Murdered Sri Lankan Editor Lasantha Wickrematunge’s Daughter Ahimsa Against Ex-Defence Secretary Gotabaya Rajapaksa in the California Central US District Court. Mob Pelts Stones at Methodist Cenre at Koombichchankulam in Anuradhapura on Palm Sunday But Police Fail to Take Action Alleges Sri Lankan Methodist Church President Rev.Asiri Perera. ” When a Christian Goes to Lodge a Complaint Sometimes they are not even Willing to Take Down the Complaint” – Sri Lanka’s Methodist Church President Rev. Asiri Perera Faults Police for Inaction When Churches are Attacked in Sri Lanka. Govt Fails to Honour Commitment to Reduce Green House Gas Emission by 4% and Plans to Establish Fossil Fuel Power Stations Generating 2700 MW by 2020 Ignoring Environmental Concerns.